Edward Mast, of US Campaign member group Seattle Mideast Awareness Campaign (SeaMAC), explains below the rationale for his group's series of ads protesting U.S. support of Israeli war crimes and details the censorship they have faced in trying to get the message out. SeaMAC's latest ad, at left, ran last week in two Seattle weekly newspapers. Check out all the great examples of US Campaign member groups' ad campaign to end U.S. military aid to Israel and learn how to run an ad campaign in your community. 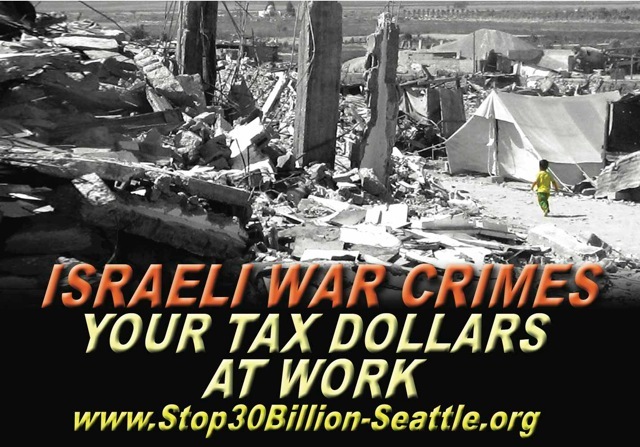 In memory of Israel’s 2008-9 assault on the captive population of Gaza, Seattle Mideast Awareness Campaign (SeaMAC) has published a half-page ad this week in two Seattle weekly newspapers with the slogan ISRAELI WAR CRIMES: YOUR TAX DOLLARS AT WORK. The slogan and design are based on SeaMAC’s bus ad which was censored by King County last December 2010. The newspaper ads are part of SeaMAC’s ongoing series of print ads drawing attention to Israel’s policies of segregation and apartheid, as well as to the treatment of Palestinian child prisoners and Israel’s attempt to impose a non-viable fake state on Palestinians. The whole series of ads can be seen at www.SeaMAC.org. 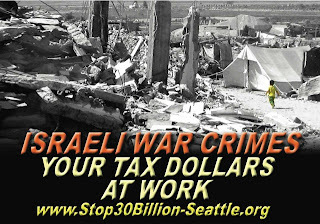 SeaMAC’s bus ad about Israeli war crimes made international news last December when it was first approved and accepted by King County Metro, then censored after pressure groups mounted a campaign to silence the ad. The American Civil Liberties Union (ACLU) stepped forward immediately and is representing SeaMAC in a lawsuit against King County for violating SeaMAC’s First Amendment right to free expression. A trial was supposed to begin in Federal Court in Seattle on October 31. However, despite considerable evidence that King County’s decision to censor the ads was neither reasonable nor neutral, a federal judge dismissed SeaMAC’s lawsuit on October 10. SeaMAC is now appealing that decision at the 9th Circuit Court of Appeals. ACLU will continue to represent SeaMAC in the case. Even though the appeal will probably take a year or more to come to hearing, SeaMAC has decided to pursue the issue. SeaMAC’s ad was attacked as inappropriate speech for a public forum, and King County’s cancellation of the ad gave implicit validation to that complaint. Those who complained about the ad brought a variety of arguments, including the claim that Israel is being unfairly singled out for criticism. In fact it is the U.S. government that singles out Israel for special treatment, giving Israel unequalled financial, political, diplomatic and military support. This special treatment by the U.S. government makes many U.S. citizens feel a special responsibility to resist Israel’s ongoing crimes and violations of international laws. The question is not why Israel is singled out for criticism, but why criticism of Israel is singled out for censorship. After the bus ad was censored by King County, SeaMAC contracted with Clear Channel Outdoor to run several billboards with a different message: “Equal Rights for Palestinians – Stop Funding the Israeli Military”. The billboards were approved and several of them were put up and displayed. However, after a week, Clear Channel cancelled the contract and took these billboards down as well, in response to complaints from unidentified individuals or groups. There was no public controversy about the billboards. As it happens, there had been considerable public controversy the previous week about another unrelated set of billboards that advocated laboratory testing on live animals, but Clear Channel did not cancel those billboards. The censoring of billboard ads with an unimpeachable call for equal rights also seems to refute another common complaint: that the “Israeli war crimes” ad was censored only because it was needlessly severe. In fact, when developing the ad, SeaMAC rejected stronger language and settled on the term “war crimes” because of its specific legal meaning: grave violations of the Geneva Conventions. Such violations by Israel have been well-documented throughout its lengthy occupation of Palestinian territories. Violations by Palestinians in their struggle for self-determination have also been documented, though violations by Israel are far more numerous and far less reported in this country. The bus ads were an attempt to correct that imbalance. During the public controversy, there was surprisingly little argument about the allegation that Israel commits war crimes. Rather, the issue seemed to be that some people believe it’s inappropriate to discuss Israel’s war crimes in public, for fear of collateral consequences not only for Israel but for members of the Jewish community in Seattle. Some friends and allies, along with King County officials, took this claim very seriously; and of course SeaMAC needs to consider people’s real fears even when those fears are misplaced. In this case, however, people’s fears are being exploited, and the State of Israel is using Jews everywhere as virtual human shields to defend Israel from accountability for ongoing crimes. An increasing number of Jews are denying Israel’s claim to represent them, and many are angry at Israel’s distortion of traditional Jewish values and exploitation of Jewish history to justify ongoing persecution of Palestinians. It is not criticism of Israel but Israel’s actions themselves that are creating hostility toward Israel. That hostility is sometimes mistakenly directed at the Jewish people generally. For this reason, we should increase our efforts to distinguish between Israel and the Jewish people of the world, as well as continuing our efforts to stop Israel from committing more criminal actions. Some have argued that SeaMAC should be satisfied because more people saw the bus ad on TV or in other news media than would likely have seen it on twelve buses for a month. However, SeaMAC’s message was not merely the eight words on the bus ad. SeaMAC chose a mainstream advertising venue because words on a bus ad not only reach beyond the usual audience, but also reach those people in a different way than the same words on a protest sign or banner. Bus ads and billboards on this issue demonstrate that there is a wide and increasing spectrum of people that are concerned and angry about Israel’s ongoing crimes and our U.S. government’s unilateral support for them. The message of our bus ads was not just that Israel commits war crimes, but that some people in the United States actually care about Israel’s war crimes, and that we care enough to risk talking to our neighbors. No billboard or bus ad will convert people by itself. Instead, the ads are trying to change people’s perception: using the fewest possible words and images to help members of our community see the conflict in a new way. Even those who don’t immediately understand or agree with the ad might look differently at Israel’s next attack on an aid convoy, or the next bombing of Gaza, or may take a step toward understanding that the conflict is not about religion or ancient feud, but about one people having power over another. While debate and protest and large-scale education must continue, public opinion in this country will ultimately be changed by all of us speaking to our friends and neighbors and engaging them with our concern and our sincerity as well as our knowledge. For all the furor, our ad campaign is an attempt to share the intensity of our concern with our community in Seattle, risking disapproval, hoping that our neighbors and colleagues will respond to our caring with caring of their own. Our right to share those concerns in a public forum needs to be defended, no matter how long it takes.